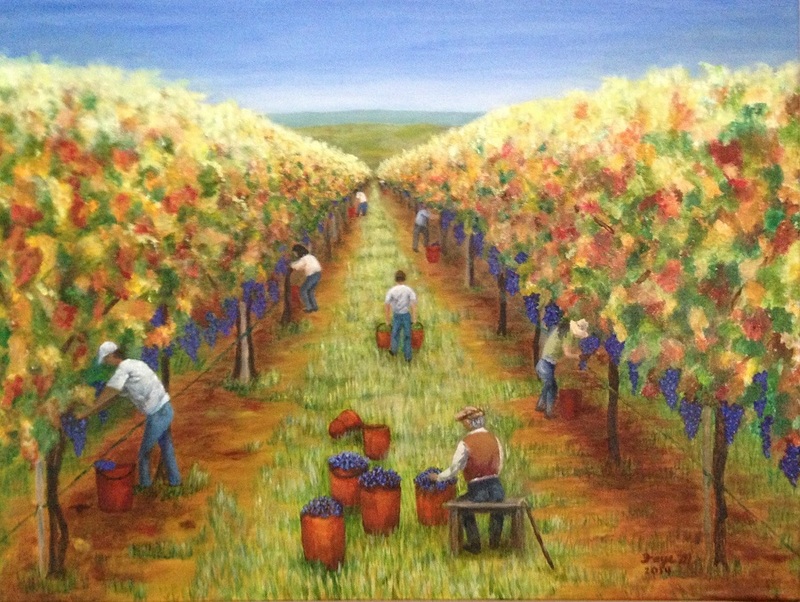 Italian Oil Paintings Series II "Life in Italy"
“Grape Harvest” depicts a yearly occurrence in the lives of many Italian families. Vineyards are widespread in Italy and some harvesting is still completed by hand. The old man sitting in the foreground might be beyond his grape-picking days, but he still comes to inspect the fruit, oversee the harvesting, and to reminisce of the family’s years of hard work and dedication to the land and their beloved vineyard. I wanted to paint a bold-colored autumn vineyard impressive in size. If supported properly, vines can grow even taller than these. I’m pleased with the added height and the overall painting of this wonderful and timeless tradition.